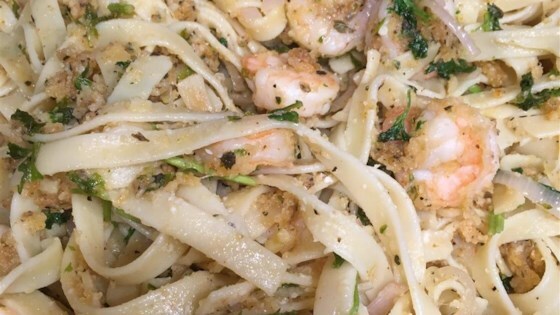 "The best scampi ever. Will melt in your mouth. Serve with a rice pilaf and salad for a wonderful meal." In a small bowl, combine flour, salt, pepper and cayenne pepper. Mix thoroughly. Dredge shrimp in flour mixture. In a large skillet, saute dredged shrimp in olive oil for 5 minutes over high heat. Toss shrimp often to prevent burning. Transfer shrimp with a slotted spoon to a serving dish, leaving the oil in the pan. In the same pan, saute the garlic, shallot, parsley and oregano over medium heat for 3 minutes; stirring constantly. Spoon the mixture over the shrimp. Return pan to the heat. Preheat your broiler for medium heat. Pour the wine and brandy into the skillet and ignite with a match or lighter. When the flames die down, stir to loosen any browned bits on the bottom of the skillet; pour over shrimp. Place the serving dish of shrimp in a preheated broiler for about 2 minutes. This classic shrimp dish features a garlicky, addictive sauce. This wasn't bad but I have had better. I added more garlic. I also thought it needed some lemon and maybe a little butter. I will not make again. This was delicious! Instead of the brandy, I added a little half & half, white wine & flour. Topped w/ fresh parmesean cheese. I love seafood and am a big "food snob." This recipe is excellent. I would definitely serve it at a dinner party.